Apparently I’m completely out of the loop as far as New York City news goes, but I guess taking two bar exams and the MPRE in a week’s time can do that even to someone who runs a blog that never misses a single interesting happenstance in the world. Self-pity aside, and ear firmly re-planted to the streets, it seems that over the course of the next month NYC will unveil two projects worthy of not only a Blogbdon mention but, as someone who seemingly manages to walk around the city with a bookbag on his back for hours at a time on a daily basis, an enthusiastic approval. Not only do these two projects focus on making that old-fashioned way of getting around the city more enjoyable, but they will provide a taste of some changes to the city that until now the New York pedestrian could only dream of: an NYC landscape devoid of city traffic. 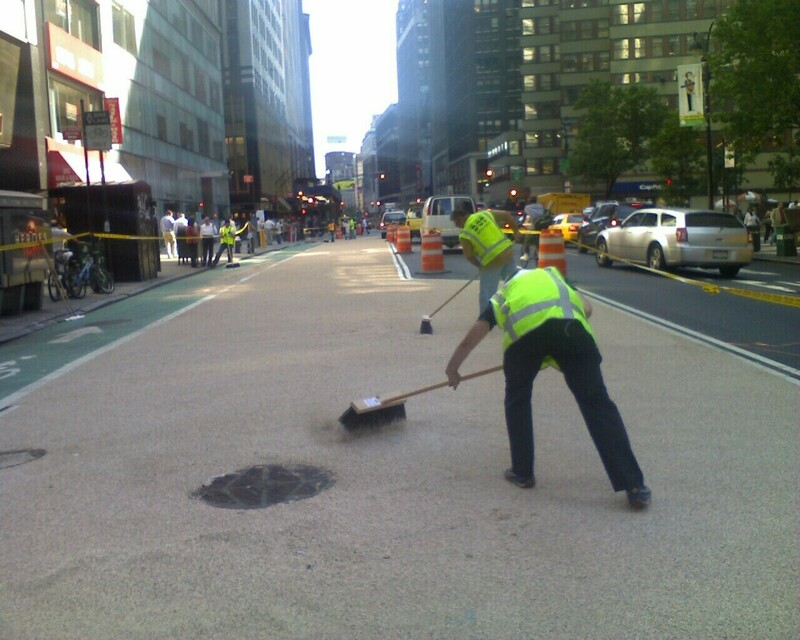 I present to you: Summer Streets and Broadway Boulevard. Even though there’s an incredibly good chance that I sleep through the entire thing, I am definitely looking forward to it, if only to see what an NYC avenue looks like without cars. 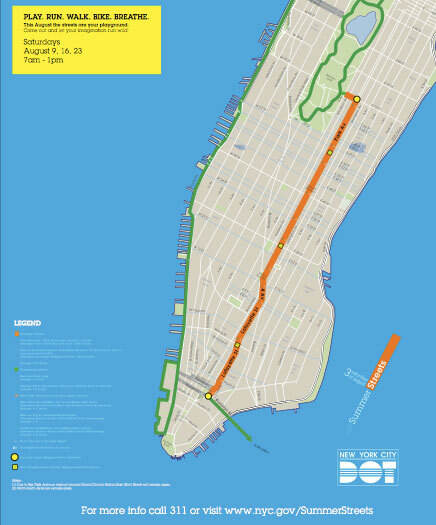 For more information, please check out the official Summer Streets website. Not only does this one hit a little closer to home personally, since I live in Midtown, but it is also a permanent project, unlike the month-long Summer Streets. The picture above is an artist’s rendering of how “Broadway Boulevard” should look when the project is finished (courtesy of the DOT), although word is that it will look a little less “cartoony” upon completion (sorry for that one). “In a surprising reshaping of the urban landscape, the city is creating a public esplanade along a portion of one of its most prominent streets, Broadway in Midtown, setting aside the east side of the roadway for a bicycle lane and a pedestrian walkway with cafe tables, chairs, umbrellas and flower-filled planters. The esplanade, which the city is calling Broadway Boulevard, will run from 42nd Street to Herald Square. Scheduled to open in mid-August, it will change that section of Broadway from a four-lane to a two-lane street. “I’m envisioning it as a public park on the street,” said Barbara Randall, the executive director of the Fashion Center Business Improvement District, which is working with the city’s Department of Transportation to create the boulevard. This should be the hotness. Since this project lacks an official New York City website, your options to click away from this blog are limited. However, you can see what the Gothamist has to say about “Broadway Boulevard” here and/or you can press the down button on your keyboard to be virtually whisked away to Broadway right now and see the current progress of the project. The picture below shows the progress of the construction at 39th Street as of this past Monday (August 4th), where, as you can see, pebbles are already being spread over what will probably be a seating area. The World’s Most Expensive Car. A vintage 1961 Ferrari California Spyder sold at auction for almost $11 million in Maranello, Italy on Saturday, the highest price ever paid for a vintage car at auction.